My daughter designed this piece when she was only 6 years old. When I asked for the meaning, she told me that Ariel was staying on a rock with her sea friends, and that she was no longer in love with her prince. For this reason she was throwing away her heart. Smart little girl or, better, modern! Everyone can get the idea of designing one special piece from a design of his or her child. Various beads and Special Glass Charms from Mill Hill. 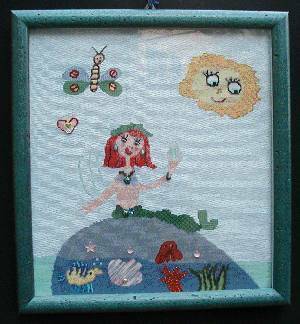 Stitches Continental Horizontal Stitch, Backstitch, Cross Stitch, Diagonal Back Stitch, Vertical Satin Stitch, Diagonal Satin Stitch, Mosaic Stitch, Fly Stitch, Vertical Knitting Stitch, Horizontal Giant Brick Stitch.